Every woman sees her wedding as her obsession. This is rightfully so because for many, us, it is a once in a lifetime event. Go ahead, look through this list of designer wedding dresses and invest on your wedding gown with no guilt. Who knows, your precious find might just qualify as a family heirloom in the future. Topping this designer wedding dresses suggestion is this beautiful ivory French corded lace dazzling ensemble by Alvina Valenta. Jewels delicately line the plunging front and back bodice, making it more distinctive. Elegance meets comfort in this one. Jessica Williams heads the creative minds behind such invigorating designs as this. She joined the bridal design world as a designer for Priscilla of Boston and later for JLM Couture as the head designer for Alvina Valenta Bridal/Bridesmaids and Ti Adora fashion lines. 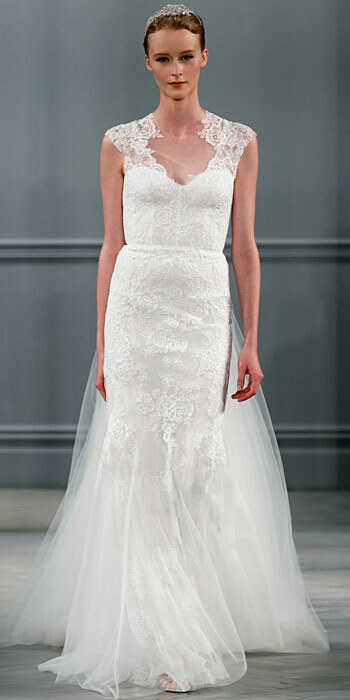 This fabulous work of art by Justin Alexander is fit for the Hollywood-siren bride-to-be. Intricately accentuated with sequins, pearls and bugle beads, the sweetheart neckline and full bodice of this mermaid gown with the stylishly layered skirt and sweep train is going to make your walk on the red carpet/aisle a definite show-stopper. 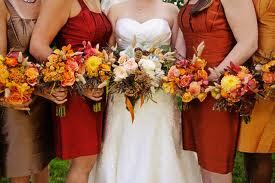 Justin Alexander is a wedding fashion designer label. Drawing inspiration from the 50’s-60’6 era, their collections are of mixed vintage-modern style that come out as unique and timeless. Designed by Monique Lhuillier, this silk gown with a barely there lace neckline embodies sweet femininity. For added allure, an illusory appliqué sheath gently traces over the bodice which pleasantly flows with the tulle train. Monique Lhuillier is a well-known Filipino fashion designer. A graduate of Fashion Institute of Design and Merchandising in Los Angeles, it is not unusual that her wedding gown would be her first project and what launched her into the world of high-fashion design. 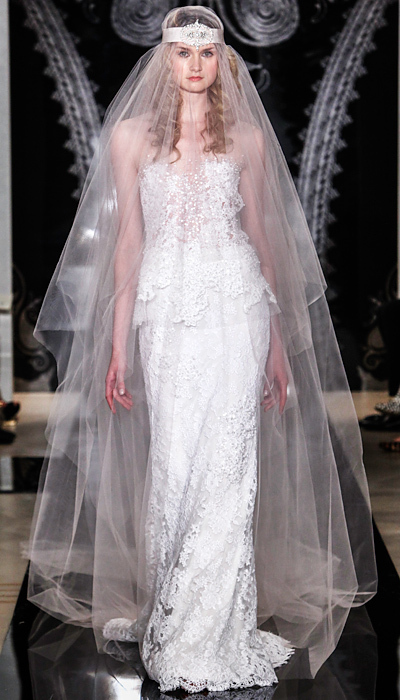 If romance is a wedding dress, this is what it’s going to look like. This lustrous A-line beauty is made of Paris satin with a dramatic overlay of lace appliqués on the sweetheart neckline, straps and bodice. Fine hand-beading scatters throughout the dress and chapel train. This romantic and playful ensemble is a definite eye-catcher for the well-endowed. Set the mood for love on your wedding day with this one by Sophia Tolli. The delicate embroidery on the strapless bodice lightly conceals the ethereal beauty while the flowing lace skirt and appliqué peplum with the unique bejeweled head piece speak of opulence. This is truly the wedding gown that is fit for royalty. This regal ensemble with a whimsical touch is unmistakably Reem Acra. The designer Reem Acra is of Lebanese descent. She developed a love for designing dresses at an early age. Many years later, she would find herself designing a wedding dress for a friend – a Saudi Princess. Today, she is popularly known for her designs are regal and luxurious – fit for a queen. Every princess’ dream is made of this – lush, floral-light ball gown daintily embellished with precious crystal embroidery. All that is missing is your hourglass figure for this Cinderella ball gown by Marchesa to come to life. Behind these luxurious feminine labels firmly entrenched in the consciousness of every red-carpet strolling celebrity is Georgina Chapman — an English fashion designer who boldly left London for the prospects of realizing her dream of making fairy tale inspired ball gowns to America. She became a raving success. 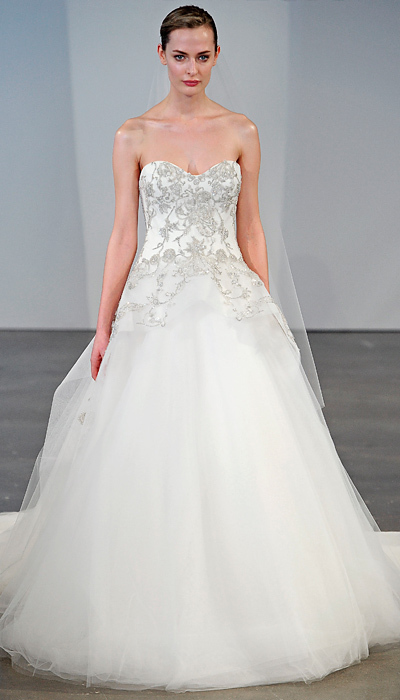 This gorgeous Chantilly Lace gown by Jenny Lee exudes grace and feminine confidence. The see-through boat neck lace appliquéd cap sleeve and the organza swirl skirt are pleasant additions for any free spirit bride-to-be. Jenny Lee is well-sought designer because of her superb skills that enhance feminine silhouette and bring out the beauty of every wearer. Jenny Lee was awarded “The New Designer of the Year” in 2005. This breathtaking A-line figure flatterer highlights gorgeous satin drapes around the bodice and dazzling Swarovski crystal- embellished straps. The plunging Swarovski crystal adorned corset back design aptly punctuates this great attraction. 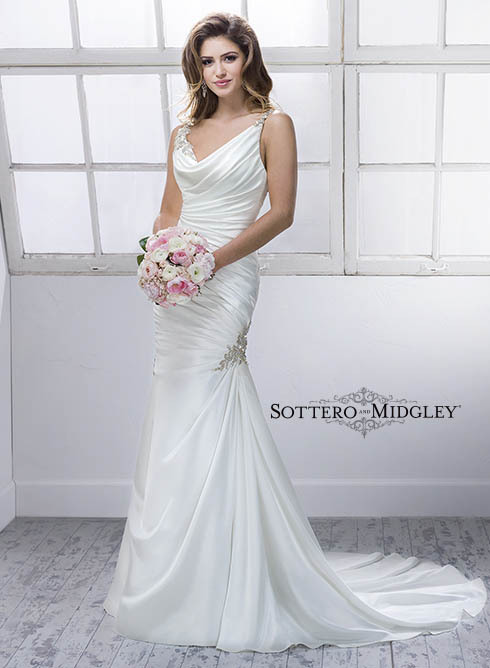 This Sottero and Midgley design spell timeless and elegant. The Sottero and Midgley fashion label is from the famous bridal design house Maggie Sottero. A hall of famer, Maggie Sottero has been a recipient of many accolades in the fashion industry, its marks of excellence being, impeccable styling and incomparable fit. This luxurious embroidered metallic lace overlay adorning a light crepe back satin slip dress paint a picture of quiet contentment — perfect for the confident and accomplished bride-to-be. The intricate Swarovski crystal appliqués throughout the bodice make this piece a sure head turner – another lovely creation by Sottero and Midgley. This long sleeve off-shoulder short and sweet rarity by Monique Lhuillier is made of ivory guipure. The airy overskirt is of ivory tulle. This ensemble is perfect for the fashion forward bride-to-be. Among these 10 breathtaking designer wedding dresses which one is your favorite?